5793 labyrinths found. Showing 4521-4540. Sorted by country, state, city, then zip/postal code. The labyrinth is located behind the Fine Arts building at the top of the loop. Parking is available on the loop and behind the building. Enter the loop at University Blvd and 5th Street. two labyrinths - 7 & 11 circuit canvas Petite Chartres and Chartres designs. The University of Central Oklahoma labyrinth is located in Heartland Plaza just west of the Y Chapel of Song on the west side of campus. It can be easily accessed from University street. The University of Central Oklahoma labyrinth is an exact replica of the labyrinth at Notre-Dame de Chartres in France and the first public permanent labyrinth created on a university campus in Oklahoma. Outdoor mown grass labyrinth also available and always open - St. Matthew's has 3 trained labyrinth facilitators available to guide walkers. Open to the public 2nd Sunday of each month from 5-8 P.M.
Labyrinth located on south side of Mullins park intersection N B St and Springer. The Prairie Moon, the one that is walked the most. It has decorated cardinal direction poles, plus an Apacheta next to it. Full sun. Masculine energy - this labyrinth is in a vortex. 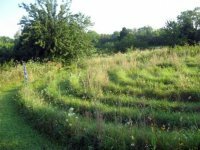 There are two classical labyrinths on the property: one by a well that is 26 ft diameter & one in open field we call Prairie Moon labyrinth that is 50 ft diameter. Can also walk by appointment - usually open to public on major secular holidays, including the Pagan holidays. The well labyrinth is a left turn & the prairie labyrinth is a right turn. Energy is very different in each. 35 38.5 N° Lat. ; 95 21.7 W° Long. Located at the corner of McGee and Brooks, north of Lindsey Street. Exit I-35 at Lindsey and go east to McGee. Turn left (north) at the light. The labyrinth is located past the children's play area on the right-hand side. Three (3) miles east on Hwy 169 on Hwy 60 to NS Road 417. South two (2) miles to intersection of EW Road 24 and NS Road 417. North East Cornter of that intersection. On campus, between Morrill Hall and Bartlett Center. A labyrinth design based on Fibonacci's spiral, including benches which provide 12 spaces for rest and for studying. The path doubles back, or turns in a new direction, on arrival at each bench, which are numbered sequentially. Annual Jack O' Lantern Labyrinth at "The Magic Lantern Celebration"
I-235 to 23rd Street. Go west to Hudson, north to NW 25th St., go west to address. Parking on street or in alley. Labyrinth is behind house. We do book the space and labyrinth for special occasions, events and activities, including weddings/handfastings, rites of passage, drum circles, full moon circles and sabbats. To book it for your special event, please call ahead. Even though the labyrinth is on private property it is accessible and available for walking without getting permission, although it is nice to knock and say hello or leave a note telling us how you enjoyed it. United Life Church is located 3 blocks south of 36th and Meridian Avenue on the east side of the road. The labyrinth is located in the southwest corner of our parking lot. Located east of visitor entrance at Mercy Health Center. Created from 13,000 red sandstone and white limestone tiles (flat surface). Located in a public cul-de-sac, this labyrinth was installed by neighbors. 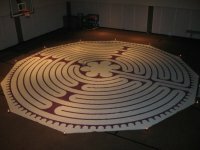 Our labyrinth is located inside the INTEGRIS Cancer Institute of Oklahoma Meditation Garden. INTEGRIS Cancer Institute of Oklahoma is open on all buisness days from 7:30 am to 5:00 pm CST. 35 36.624 N° Lat. ; 97 37.330 W° Long. Hours of operation are Monday thru Friday 9:00 to 5:00 and Saturday 10:00 to 2:00. World Labyrinth Day, May 6, 2017.